Christmas is right around the corner, that means it is time to decorate your home and office. 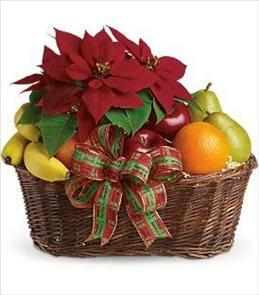 One of the best ways to incorporate some Christmas cheer is with a beautiful arrangement of poinsettias. These lovely red, green, pink, white and plum flowers feature the colors of the holiday so don’t be afraid to make them the centerpiece in any room. Poinsettias are officially classified as ornamental shrubs native to South America where they were originally referred to as “Flor de la Noche Buena”. This translates to the “Flower of the Holy Night”. Historians widely agree that the poinsettia was first used as a Christmas decoration in the 1600s when Franciscan monks used poinsettias during their Nativity ceremonies. Mexican legend states that a young child was traveling to a community Nativity scene and realized that he forgot to bring a gift for Christ. He stopped half way, plucked green blooms from the roadside and carried them the rest of the way. Upon arrival, this child was ribbed by his peers for bringing such a plain gift. However, when the boy placed the blooms at the manger, a glorious red flower shined atop the greenery. This legend is central to the connection between poinsettias and the Christmas celebration. It won’t be long until Christmas day is here. Seize the opportunity by decorating your home and office now. Implementing Christmas flair in the form of poinsettias and other Christmas decorations makes your home feel that more spirited and cozy. All it takes is the strategic placement of poinsettias and your living space will be rife with Christmas cheer. Poinsettias make fantastic centerpieces in and of themselves. Poinsettias are rich looking flowers with visually impactful colors that transform the style and feel of a room. Implement poinsettias as the centerpiece of a room within your home or workplace and everyone who walks in will feel festive. Give poinsettias a chance and you will find that they truly do make the holiday spirit quite contagious. Picking out the perfect Christmas gift is a challenge we would all like to simplify. Don’t fret any longer. Order some beautiful poinsettias for that person on your Christmas list that is difficult to shop for and she will be more than thankful for her lovely new flowers. Poinsettias make even more sense as a gift for those who live far away. Have some gorgeous poinsettias delivered to a friend or family member’s door this holiday season to wish them a happy holidays. 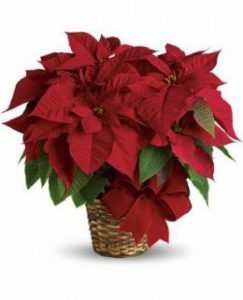 If you have an upcoming Christmas party for work, school or another organization, pick up some poinsettias as a hosting gift. After all, who doesn’t love flowers? In particular, poinsettias are especially beloved during the holidays thanks to their festive colors. This is the hosting gift that keeps on giving as everyone who visits will obtain some enjoyment out of these gorgeous flowers. Order some lovely poinsettias through Brant Florists and we will incorporate a special message to make the flower arrangement that much more meaningful. We take great pride in the quality of our flowers as well as the words that make up their accompanying message. Put your trust in Brant Florists and we’ll help you make this holiday season unforgettable. 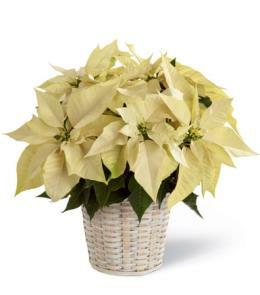 Reach out to us today to learn more about our poinsettias as well as our other floral arrangements and place an order. You can contact us by phone at 877-545-5535 or send us an e-mail at orders@brantflorist.com.